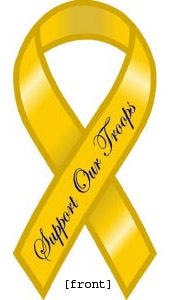 New York, NY Imaging specialists at NYSU have made a shocking discovery about the ubiquitous �Support Our Troops� bumper stickers. By using a special experimental process which combines ultrasound, infrared and black light technology, University Experts have uncovered evidence of a secret draft (see enhanced image to the right). White House sources have confirmed that the draft will take effect in January, 2006. The timing is very crucial to America�s involvement in Iraq, when the tour of duty of as many as 1/3 of support crews will draw to a close. Over half of the soon-to-be inductees are above the age of 55. Some critics have argued that is not wise to draft this age demographic. The AARP has rallied seniors to dispel this claim by showing that stereotypes based on age are inaccurate. They plan to do this by employing their years of experience in roles as diverse as food preparation and vehicle maintenance. Some social activists, who often oppose many of Bush�s measures, are actually pleased about this secret sticker draft. �Historically the composition of the U.S. military has skewed toward poor urban and rural youth. This measure has found a way to force the under-represented demographic to shoulder a greater responsibility for our nation�s defense�that demographic being upper-income suburbanite retirees,� said one activist.